Most of us in New Hampshire and Vermont have a vegetable garden or at least a kindly neighbor who will share extra zucchini. As the harvest abounds at this time of year, the real fruits appear at local farmers’ markets, found easily across the two states. 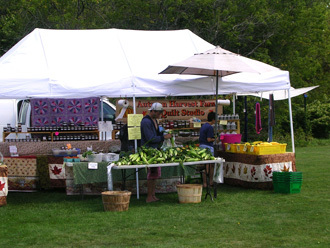 There are 55 farmers’ markets in Vermont with regular weekly markets from May to October. 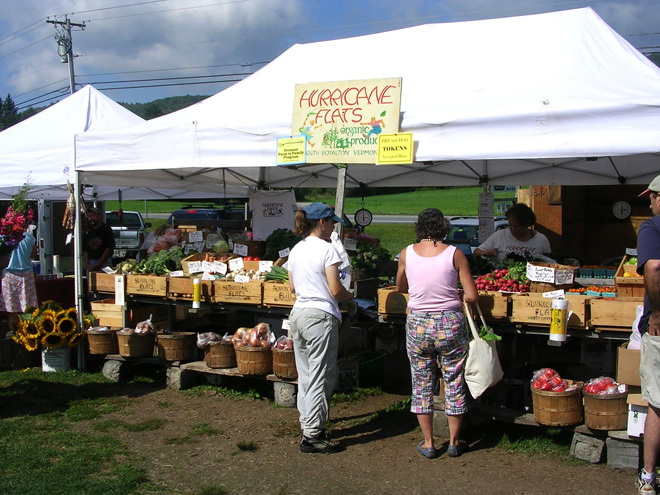 A Vermont state list gives locations and vendors and even gives a visitor a time guideline of what goods are available during which months of the year. 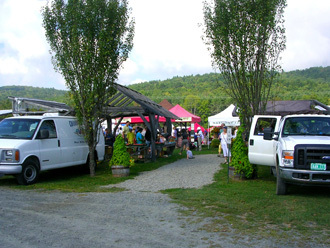 We recently visited the Norwich Farmers’ Market on route 5 south in Norwich, Vermont. As the produce harvest is in full swing, there were ears of corn, bunches of greens, and mounds of tomatoes in all the produce stands. Heirloom vegetables stand up strong and will out-flavor anything you can buy at a supermarket in the summertime. Most of the week’s groceries can be purchased at a farmers’ market with a little planning – natural and grass-fed meats, artisanal cheeses and breads, eggs from happy free-range hens, and home-harvested honey, maple syrup and jams are available. In addition to food goods, vendors offer home goods such as quilts, knitwares and home spun yarns. 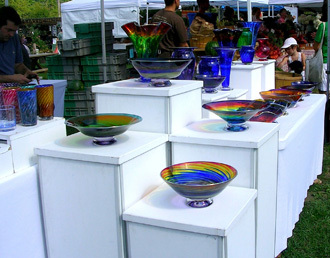 Craftsmen and women offer carved wooden bowls, hand blown glassware and jewelry. For entertainment, a storyteller spun his own yarns for the children in the center of the Norwich market. The small audience lay on a large quilt in the shade under an awning as Simon Brooks captivated these youngest patrons while their parents browsed the stalls. For lunch, some vendors set up full kitchens to give us sweet and savory crepes from Vermont Crepe and Waffle, Mexican entrees, sausage sandwiches, and iced cold lemonade. The cheese vendors all offer free samples, small cubes of sharp cheddar, cow, sheep and goat cheeses, both straight and enhanced with amazing herbs and spices. The Norwich Farmers’ Market is one of the largest in the state with permanent wooden booths and a loyal clientele. Just across the river from Hanover, New Hampshire, the market draws large crowds every Saturday. In New Hampshire, locals and visitors can visit the 75 farmers’ markets held on various days through the week from May to October. After our visit to Norwich, we stopped by the Enfield (New Hampshire) Farmer’s Market in Huse Park. 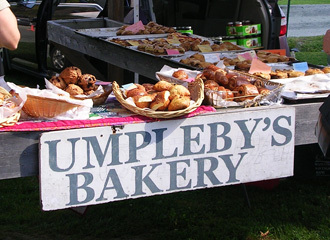 Enfield’s is a typical small town farmer’s market with fewer vendors than Norwich, but the same high quality of local goods. Autumn Harvest Farm and Quilt Studio of Grafton, NH had wonderful produce and some beautiful quilts as well as a huge selection of jams, relishes, and seasoning rubs. The Blue Ox Farm, a local organic grower in Enfield, had a bit of everything from their lush fields. One small vendor had a limited selection of produce (we got there at the end of the market), but luckily had some cookies and other baked goods which hit the spot. For the hard-core marketer, when October 31 represents not goblins and candy but the sad end of another growing season, the winter farmers markets spring up in various towns. In the Upper Valley, the Lebanon Farmers’ Market (NH) is held once a month in the United Methodist Church. Vermont boast several indoor winter markets with excellent turn-out, in both vendors and shoppers, in Brattleboro, Rutland, Middlebury and the Burlington area. New Hampshire continues the farm season through the winter with many indoor markets held once or twice each month, November through March. We still have a little time left in our market season, so please visit one near you soon. It’s worth the trip! New Hampshire Farmers’ Market Assoc.